I am so pleased I have finally cracked all the problems I was having with the calico test of the Five Coat. Having said that, it has been a long journey and for a while I was going round in circles making slower progress than I would have liked – and using more calico and pattern paper than was reasonable. I need to do something about this, and it needs a little thinking outside of the (police) box, so to speak. My solution? Well, I have given it some thought and I think although I can pick up new skills quickly by study professionally made garments, because I am self-taught, there are probably short-cuts and simple tricks I could use if I had some structured training. I have looked around and found that a local college network runs courses in dressmaking and tailoring to a variety of skill levels. It is not long before courses start and enrolment is very soon, so I a few weeks back I made some enquires and got myself along to West Herts College in Hemel Hempsted to sign up. Because I have worked in my own little bubble with no contact with others, I truly do not know my skill level. I am certainly above the ‘beginners’ level, but am I ‘intermediate’ or “advanced’? Which would I get the most from? 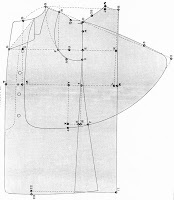 I don’t want to be on a course that teaches me how to thread a needle; likewise I don’t want to be lost trying to learn couture fashion with corsetry as a speciality! As it turned out, both the beginners and intermediate courses were full, and had been for some time as they are constantly over subscribed to, leaving me just the advanced as an option. After telling the tutor about the commissions I had been taking on recently, she was perfectly happy to accept me for the course and thought the others would have been too basic for me anyway, which is sorta good to hear. In the notes for the course it states that some materials are supplied, but the students are expected to provide most of what is needed. I guessed there would be sewing machines at the college, but that they would be electric (hisssssss). I will have to take my own machine with me – but since my prized 27K is now fused into its treadle table, I decided I needed a new machine to use for the course, besides, the 27K is very heavy to carry around and comes in a massive coffin-style case. I therefore found a suitable 28K on eBay (see right), which was Singer’s “lightweight” machine, and is a better one to be carrying around. Today (Wednesday 30th September) was the first day of the course, so I set off for Hemel Hempsted (which from Borehamwood without a car is a pig of a journey) carrying my new 28K Singer hand-crank. I arrived at the college about 30 minutes early and quickly found the room for the course. I met the tutor, Nicola, and introduced myself – and my 28K. As the other students arrived I quickly realise I am not only the youngest there, but also the only man! After everyone’s interest in my sewing machine, we settled down to work and Nicola set us up with learning some basic and more decorative seaming methods (see below). During the breaks in proceedings I was able to chat to Nicola about what I was looking to get out of this course and what I would like to do as part of the coursework. 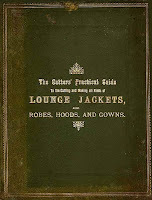 In its pages are included some unique methods of taking measurements; producing a block from which to work; and some up-to-the-minute (for 1892) styles of jackets (see right). My plan is to follow its instructions as part of the coursework, and with Nicola’s help, make my block on which I could base some future projects. 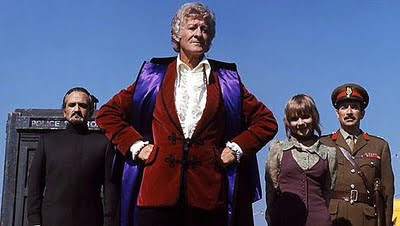 Furthermore, as part of the practical work, I have found period design plans for an Inverness Cape (see left), as worn by Jon Pertwee (see below). I have chosen this in particular, as it has a fairly simple overall shape, with little tailored fitting, but has some design points I want to brush up on, namely setting collars and hemming a lined jacket. I left the first lesson fired up with the feeling I was at last going to have the structure and focus my work had lacked. Check back to see my progress as the weeks go by . . . .
Also just thought Iʻd mention that the banner for the Tennant Coat blog always reminds me of some sort of food. I canʻt work out whether it reminds me of the biscuit base in cheesecake or flapjacks or something. For the record, it's a detail scan of the Alcantara fabric! Ah I had an inkling it might be!